Can a nursery be supremely stylish and still work as a great sleep and play space? 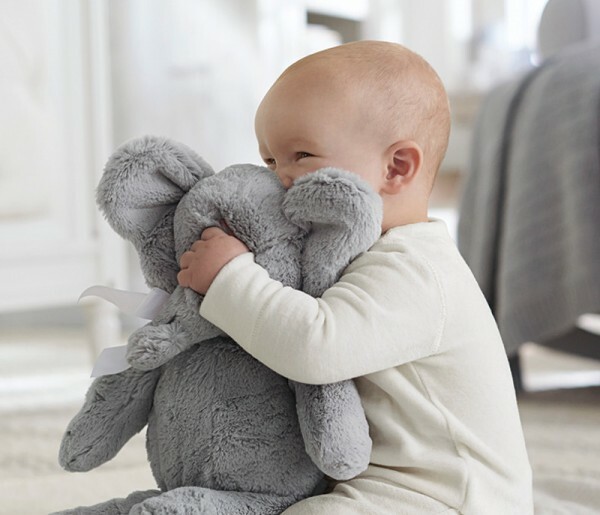 We’ve consulted the experts at Pottery Barn Kids to give us the top tips for striking that perfect balance, and reveal some styling secrets that will make your baby’s nursery a triumph of form and function. 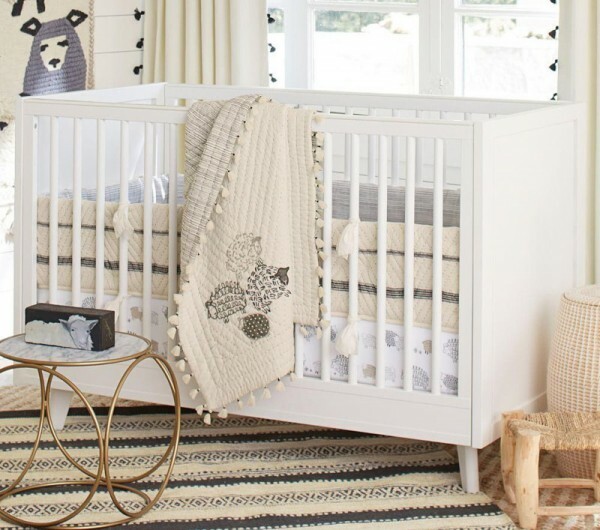 If you’ve ever set foot in a Pottery Barn Kids store, you’ve no doubt been in awe of the stunning nursery set-ups created by the very talented staff. We’ve managed to pin down super-skilled Pottery Barn Kids Field Visual Manager Ebony Quaid to give us the low-down on creating a visually impressive, yet completely usable space for your bub. Take notes people! Ebony recommends taking your time to choose the hero piece of your baby’s nursery – the cot. This includes taking precise notes on the dimensions, shape and architectural features of the room before browsing in store. Find a theme for the nursery, and make sure the cot fits the overall aesthetic, space and design. The cot is a smart starting point, since much of the activity in a nursery will be centred around it. Plan ahead when arranging furniture close to the cot, to ensure it’s at a safe distance for when your baby starts moving around. Tables, dressers and other items that could be used for leverage should be placed a safe distance away. Ebony says if you’re partial to the current modern-Scandi style, or a mid-century vibe, go for something like the Reese collection. If you’re after a soft, vintage look, the Blythe (pictured below) is perfect. Top of the pops when it comes to choosing linen, according to Ebony, is quality. 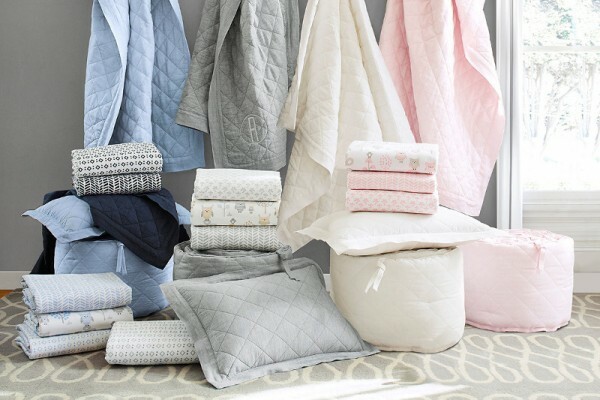 Your baby will spend many hours sleeping, and of course the bedding will go through hundred of washes. 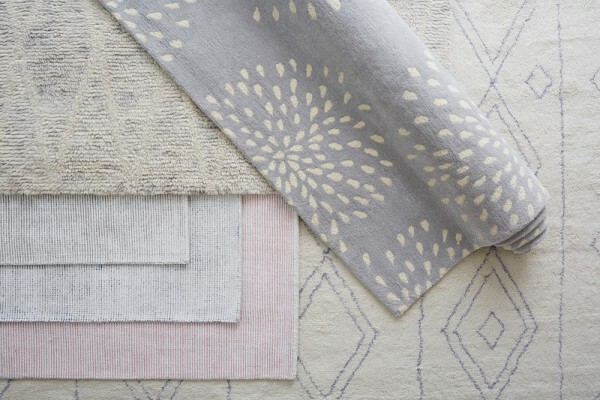 Bang on trend at the moment is grey linen, with layering in pops of colour. Ebony says pastels and calm colours are also really popular and are easy to accessorise. As much as this piece of furniture is for your baby, it’s for you – and therefore Ebony says a nursery chair is almost as important as the cot. 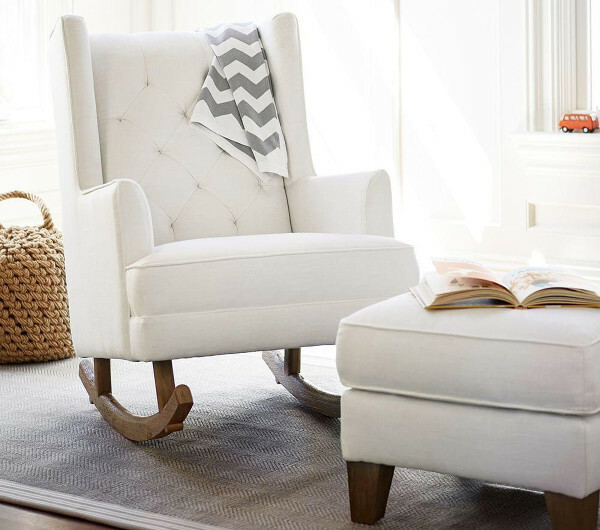 Winged sides (like those on the Modern Tufted Wingback Rocker below) to rest the parent’s head when feeding are worth considering when purchasing your nursery chair. An ottoman for keeping your feet up is a nice addition for extra comfort, but only if space permits. When thinking about setting up a changing station in your bub’s nursery, longevity is key. 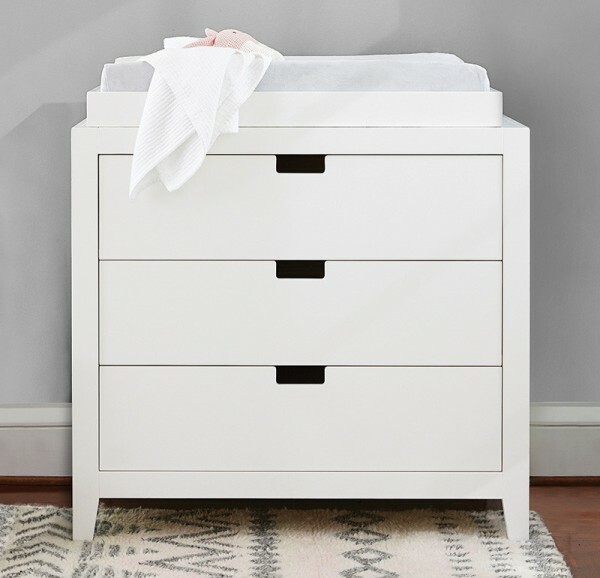 She also suggests considering how the changing table will fit in the nursery when the drawers are open. “Good storage, smart organisation and efficient use of space are key to creating a nursery that’s easy to use and fun to spend time in,” Ebony says. That means considering what’s safe for your little one, once they’re crawling about in their room. When deciding how to arrange storage shelves and drawers, start from the bottom with soft, safe items, and keep heavier items, such as collections and keepsakes, up higher. Set up shelving and storage buckets so that stimulating toys can be stored at ground level, where they’ll grab your baby’s interest and encourage their curiosity. Items such as canvas totes are functional, soft and are a great way to add colour and style to the nursery. 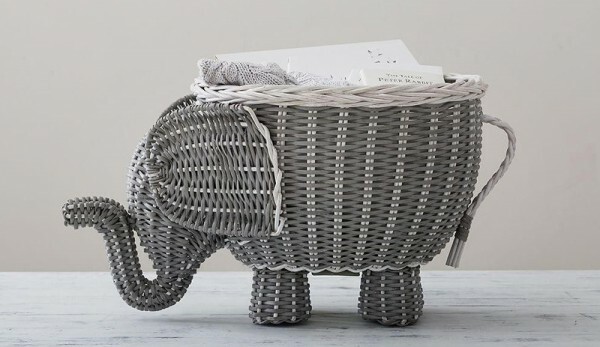 Pottery Barn Kids’ woven silver rope nappy caddy and Elephant Shaped Storage is perfect for additional storage, and adds a touch of elegance in the nursery. When choosing the rug for your space, consider the size that fits within your nursery. To find a suitable size, use painter’s tape to layout a mock area of where the rug could be placed. Rugs are a great way to anchor a room once furniture is placed upon it. Soft-to-the-touch rugs like natural loop, chenille and shag rugs are trending. Grey continues to be a consistent favourite for nurseries, however a rug is a great opportunity to add a pop of colour or pattern to a room. Also, finding that perfect plush comforter may help beat the bedtime battles. Once your baby is old enough to have their favourite toy share their sleep space, bedtime may become a little calmer. 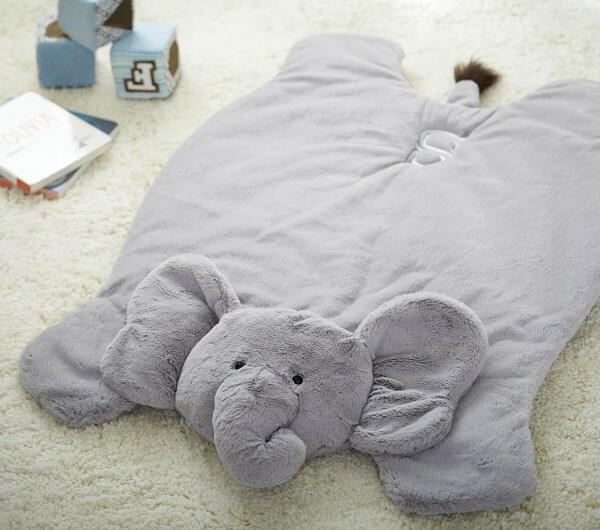 How adorable is this Elephant Plush Play Mat? It’s a gorgeous decorator piece for a nursery, but doubles as the perfect place to practice tummy time – bonus! A pendant or table lamp is essential for feeding times, while window coverings help to darken the room for naps and bedtime – they are also a beautiful part of the decor and offer a great way to reduce noise and control temperature, especially if you use the blackout curtains. 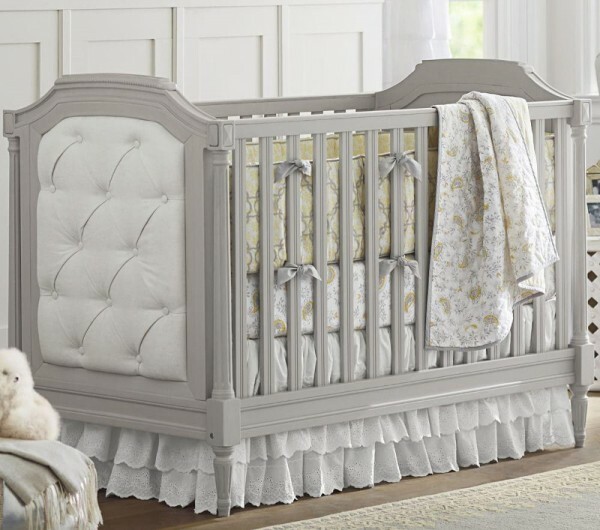 Gold and brass have been very popular nursery choices lately, as well as unique items such as a tulle canopy or cornice with sheer curtains.